Updated book "Analog Synthesizers 2nd Edition"
and related website coming June 2019. A major campaign to make my CD albums available by download is complete, with 20 albums featuring over 200 tracks available worldwide through Amazon, iTunes and all other major outlets. 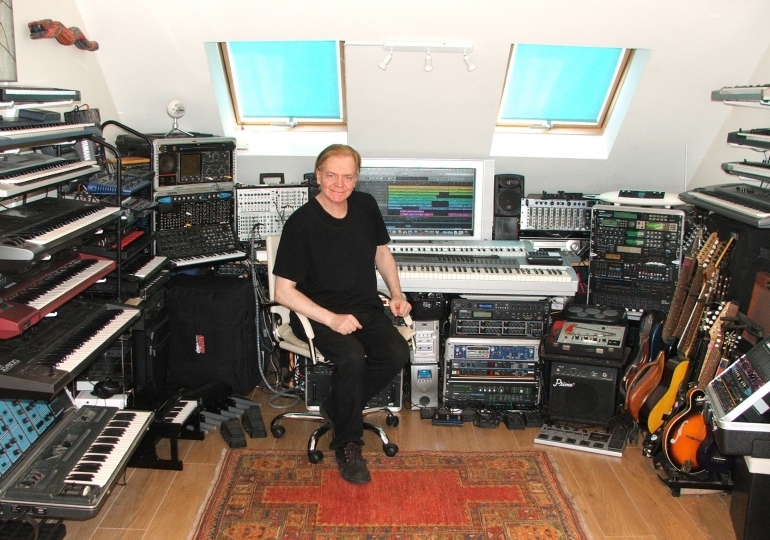 Albums include "Tubular Bells for the Moog Synthesizer" and the Edgar Froese tribute CD "Change of Cosmic Address". "Soundstreams by Mark Jenkins", a series of library music albums for download through Amazon and iTunes opened with Vol.1 "Stranger Nights", in the style of John Carpenter and Tangerine Dream. See the main website for details. MARK JENKINS has been a leading figure in the UK's electronic music scene for over 20 years, has performed as a member of WHITE NOISE and with singer ARTHUR BROWN and members of Can, Gong, Van Der Graaf Generator and Tangerine Dream, and is the author of the acclaimed book/website "ANALOG SYNTHESIZERS 2nd Edition" and book "iPAD MUSIC" available worldwide through Amazon. He has created music for live performance, advertising, TV & CD releases and has performed at the London Planetarium, Royal Greenwich Observatory Planetarium, London South Bank, Franklin Institute Philadelphia, Carnegie Science Center Pittsburgh, National Theatre Brazil, and in France, Germany, Holland, China and Russia. Mark Jenkins became the first musician in the world to release a CD created entirely on the Apple iPad, with live performances in Holland in October 2010 and extensively in the USA in 2011, with features on BBC Radio, Channel 5 TV and in The New York Post. USA East Coast concerts were completed in March 2012 and 2013 with live iPad shows at the National Exhibition Centre "GADGET SHOW LIVE" in 2012. Further concerts in 2019. BOOK "iPad Music" now worldwide as paperback & Kindle. "EX1GENE: The Yamaha EX1 Album" now on download and CD! You can see iPad and other electronic music concert and studio extracts on the YOUTUBE page linked below. The main website also offers a full biography, promotional pics, CD sales, library music downloads and more. You can also visit the FACEBOOK page.